A morning image of the Virginia Beach Fishing Pier. Captured: April 9, 2016 @ 8:24 a.m.
Vacationing at the beach? The Virginia Beach Fishing Pier is a must see! Pickup some valuable travel photography tips and advice before your visit. This featured image is certainly one of my favorite and most viewed photographs on my fine art website on Fine Art America. Planning a photo shoot in clear weather can deliver amazing and breathtaking scenes; however, and most importantly, it depends on what your artistic goal happens to be. Moreover, some photographers tend to shoot only on sunny, gorgeous days; yet, several of my most valued images are a result of shooting in severe climatic conditions. Nevertheless, developing a pre-planned visualization of what one expects to achieve is beneficial as well commendable. Though on occasion, just getting out with a camera is enough to get one underway! 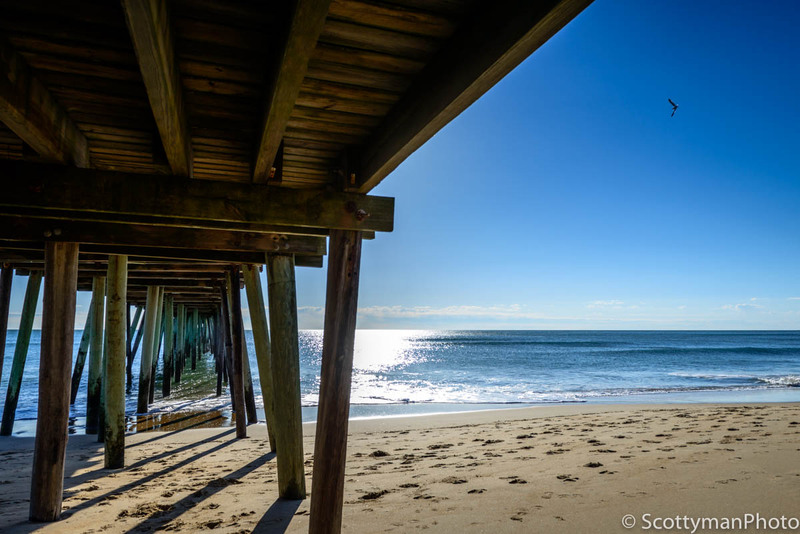 The Virginia Beach Fishing Pier offers a variety of potentially stunning images, just there for the taking. No people to clutter your image. Remember the golden hours, occasionally, rules can yield unexpected benefits as well. In addition to capturing those beautiful reflections and colorful scenes in the morning hours, activity on the beach was virtually non-existent. Thankfully for the early riser, foot traffic usually doesn’t start appearing until after 9 a.m.; additionally, footprints in the sand become more pronounced as movement beneath the pier increases. Summer months are the worst for pedestrian traffic, consider early spring or winter if you want to cut down on distractions. Depending on one’s goal, moderate wind gusts might be preferred to facilitate water movement for a long exposure; however, unless you’re looking for tidal waves, low winds help to diminish the sea breeze which decreases saltwater intrusion in one’s camera and lenses. Well … what can I say? It’s the Virginia Beach Fishing Pier folks! Available parking is usually equivalent to locating a needle in a haystack, especially during the peak summer months. Ordinarily starting near Memorial Day and ending near Labor Day, photographing during peak season decreases your chance of grabbing a decent parking spot, much less, a close one! One should expect to pay twenty dollars to park close to the pier. Other options include parking across the street utilizing parking meters, although a short walk, it could be quite cumbersome hauling heaps of equipment down to the beach. Availability of meter parking usually presents no problem in the early morning hours, regardless of the season. In addition to convenience, meter parking also provides an opportunity to pay with coin or credit card. As for myself, shooting out of peak season meant available stress-free parking as well as extreme proximity to the pier, all for the modest price of five dollars. Humidity is often overlooked by new photographers. Water vapor on a lens caused by the rapid change in environment affects lens clarity, not the ideal scenario! Hard to acclimate, the fog tends to hang around and could potentially remain problematic for several minutes resulting in a lost photo opportunity! Shooting out of season proved beneficial, and the low humidity made this issue a moot point! Earlier stated in my biography, I opined that an Artist uses equipment to capture a vision, if true, one should then ponder the question, did I get it? After returning home and during post processing, I recalled the vision that I had been hoping to capture, although there is room for improvement, I felt overall satisfied with the results in Lightroom. Having a vision allows one to stay focused on the goal, and prevents meandering about looking for a subject. Consider the following and ask yourself a question: which would I rather go home with, 200 run-of-the-mill images or one fantastic shot? Generally speaking, the best scenario is to have the entire Virginia Beach Fishing Pier to yourself, and for the most part I would agree; however, overlooking personal security can have dire consequences. Although this location bestows a small risk on its patrons, anyone planning a 5 a.m. photo shoot should proceed with caution! Seclusion from the boardwalk in conjunction with poor lighting could provide an opportunity for a prepared thief. Personally, having been a Virginia Beach resident for several years, it was of little concern; nonetheless, one should exert caution and remain vigilant. Darkness prevailed over the land. Offering limited lighting within the confines of the pier itself, one may find it difficult setting up equipment, especially if it’s your first visit. I do not recommend depending on the adequacy of installed lighting. Impractical location for lens swapping. Sensor dust is always a concern, but it’s easily removed during post-processing utilizing Adobe Lightroom or Photoshop. Of course, there’s no substitute for keeping your equipment in tip-top condition. Striving for prevention is the best resolution in my humble opinion; nevertheless, it’s impossible to eliminate sensor dust completely! Although efforts to eradicate or minimize saltwater intrusion are certainly advisable, saltwater and sand can significantly contribute to the deterioration of the internal components of one’s camera and lenses! I do not suggest swapping lenses on a windy beach without some barrier. One can mitigate security and safety anxieties with the deployment of some basic awareness, i.e. locked doors, hidden gear, etc. Paid parking offers some additional advantages, such as on-site security and barricades providing limited access to vehicles by the public. Numerous paid lots are frequently open for business 24/7 in the peak season and offer some security. Unfortunately, during the off-season months, most lots are either vacant or closed providing little to no security, although if open, usually offer free or reduced fee parking. Frequently, parking attendants are not available until later in the day. I know what you’re thinking… “free parking!” Right? Personally, five-dollar parking in the off-season, offering any security is good business! The Virginia Beach Fishing Pier does require a fee for access to the pier. Wait, don’t panic just yet, the Pier is open 24 hours a day, usually starting Memorial Day and ending around Labor Day; additionally, access to the upper-level of the pier is only two dollars if you’re not fishing. Unrestricted no-fee access beneath the pier is the good news; therefore, if you’re looking to capture an image similar to Down Under, you will enjoy the savings of two whole dollars! Grim prospects for coffee in the early morning hours. Unprepared coffee consumers may find it especially burdensome when photographing out of peak season. Arriving ill-equipped can leave one with a bad taste in one’s mouth. If you didn’t bring it, you will probably not find it, at least not until after 8 a.m. If you’re a new photographer or just interested in honing your skills, have a plan in mind before arriving; remember what you wanted to accomplish, and stay focused on the goal. Whenever possible, show up a few days in advance and scope out the site. Implementing a slight bit of reconnaissance, one can gain valuable information; which in turn, can significantly improve the outcome of your work. Regret stinks! Arriving back home discovering you missed the shot can be very disappointing. A prior visit and a few test shots could pay enormous dividends; moreover, showing up well prepared with the right equipment can dramatically improve your performance as well! Don’t leave it at home. Photoshop performs like a well-oiled machine; however, one of my primary objectives, to the best of my ability, is to get it right in camera! Most organized photographers depart for the shoot well prepared and eager to capture their vision. Consider conducting an inventory or perhaps making a simple list the night before, see my Photo Shoot Checklist. Realizing your spare battery is still at home on the dresser becomes a bone-chilling thought, after receiving a low battery warning while miles away from civilization. Allow your gear to acclimate to the climate. Faced with high humidity at the Virginia Beach Fishing Pier, ensure you allow sufficient time for equipment to acclimate. During the golden hours, time can be a critical factor in getting the shot; furthermore, water vapor may be difficult to remove from the exterior surfaces, not to mention impossible from the interior. Therefore, the night before, consider leaving your camera bag in a non-air-conditioned garage or vehicle, hidden, of course. This will allow your gear to gradually acclimate. If you’re running behind, prior to departing your air-conditioned bungalow, place your camera and lens in a zipped plastic bag to accelerate the acclimation process. Lastly, if you really must get the shot, plan an early arrival. Allow at least twenty minutes with your camera on a tripod. Consider carrying a flash in your bag. Flash helps to freeze motion and can certainly help out when you’re attempting to capture a bird in flight! However, if your camera bag is already pushing the limits, leave the flash at home. Having a helping hand is never a bad idea; likewise, on those early morning hours alone on the beach, a friend may also provide comfort while serving as an additional crime deterrent. Do NOT change lenses on the beach. Return to the car or duck off into a store or coffee shop. Implement two cameras, one fitted with a zoom and the other a wide lens. Last resort, use a barrier such as a towel or a tent. Before I miss the shot, I WILL change the lens! Don’t leave gear in plain sight. At the risk of sounding condescending, don’t leave equipment visible in the car. Theft being aforethought, and having seen it many times, I feel compelled to write about it. Furthermore, I recommend against using camera bags that sport well-known company names such as Nikon or Canon for obvious reasons, nothing against them at all! Check out my review of the Think Tank Retrospective 20. Personally, I feel advertising a well-known brand tends to double the temptation for theft. DO NOT FEED THE BIRDS! Although having a great desire to capture a seagull in my image, I had no desire to remove bird feces from myself or my equipment later! Additionally, there’s no reason to leave more deposits on the pier. My advice, wait for the shot. With an early arrival don’t count on finding coffee. The Virginia Beach Fishing Pier does not open that early, especially during the off-season. One may have more luck in the peak season; nevertheless, in any case … “fail to plan, plan to fail!” Ok, coffee may not be essential gear for you, but if so, heed my lesson learned, if you intend on arriving before sunrise bring your coffee!